We are getting ready for a little road trip with the kids this week. It's an approximate 4.5 hour drive with the kids. It's certainly not the first time we've driven to our destination with kids. We made a 2.5 hour drive a couple weeks ago to Sacramento for a Fresh Beat band concert, and we made that same drive a few months ago to visit the Sacramento Zoo. We have made the 4.5 hour drive several times with them, and don't forget, every other year we make the 9-ish hour drive to Disneyland. 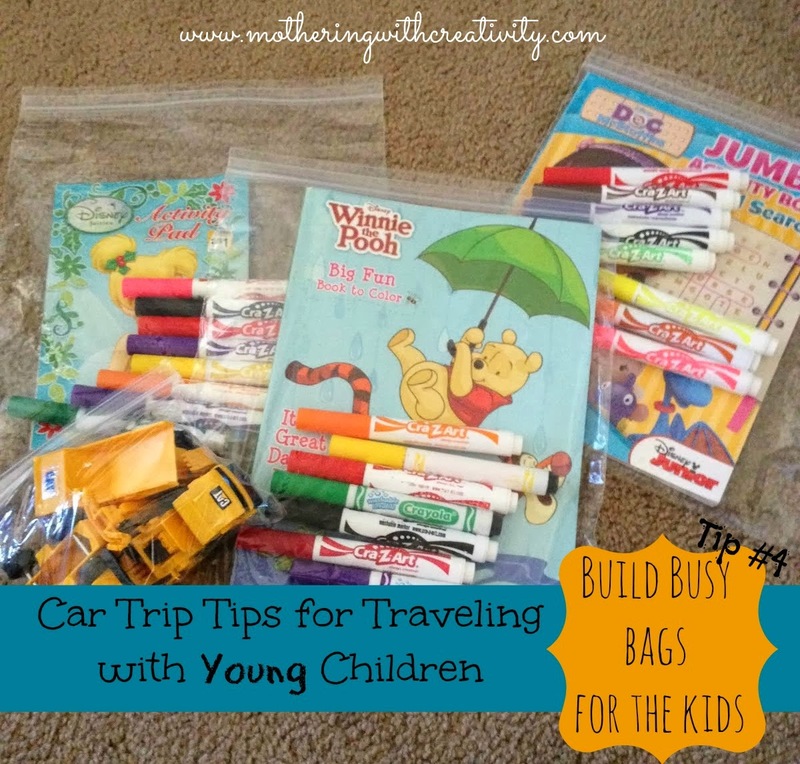 I do have a few "road-tripping with kids" tips that always help me out a ton...and today I'm going to share some of those with you! 1. Always start with a clean car. I know...your car is probably already messy like mine is (4 kids will do that), and you're thinking that it's just going to get messier, so why bother cleaning it? Here's my answer: that super extra messy car is going to drive you nuts! The piles of toys on the floor are going to make your car feel more crowded than it really is, and when your child drops that little bracelet that she has to have, you aren't going to be able to find it with any sort of ease. For sanity's sake, start with a clean car. We usually make this a family event with all of us cleaning everything out and then taking turns vacuuming different sections of the car. Every one helps out, and every one has fun. A clean car at the beginning also means less of a mess to clean up at the end of the trip. It reads "Ellie the frist (first) one." Compliments of my 6 year old first born. 2. Keep plastic grocery bags handy. These can serve a million uses. We always have one available for garbage...garbage all over the car is annoying and gross! When we make a bathroom or food stop, we throw away the garbage bag and start a new one. These bags are also great for puking, soiled clothing, and holding various items. This box developed out of our Disneyland trip a few years ago. We all got the stomach flu on the way down and ended up buying all sorts of medicines. When we got home from that trip, I immediately put the box together. You can also repeat some of these bags by changing out something in them. For instance, you can do another bag with a second new coloring book and put colored pencils in it instead of markers. 5. 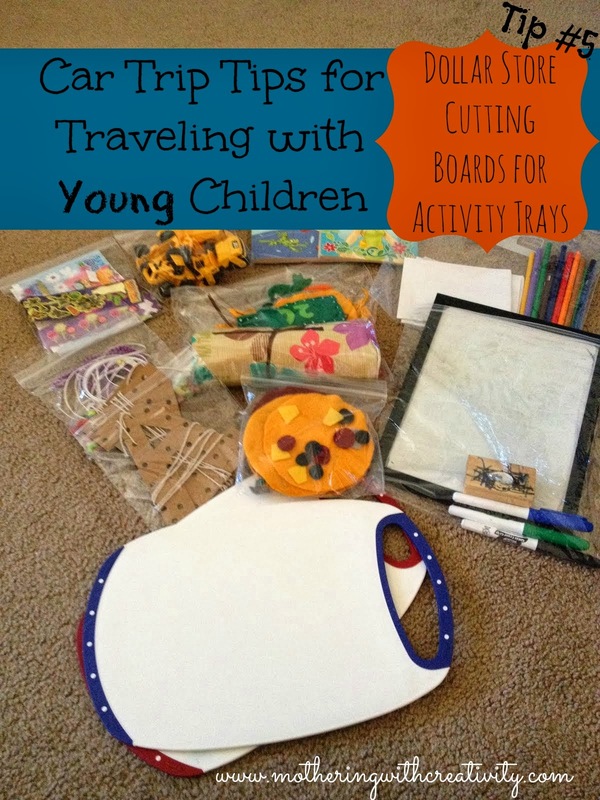 Buy Dollar Store cutting boards for activity trays. Obviously it is difficult to color on paper without having something firm behind it! Skip the expensive and bulky activity trays and instead buy each child a cutting board from the Dollar Store. 6. Pre-Bag Snacks. 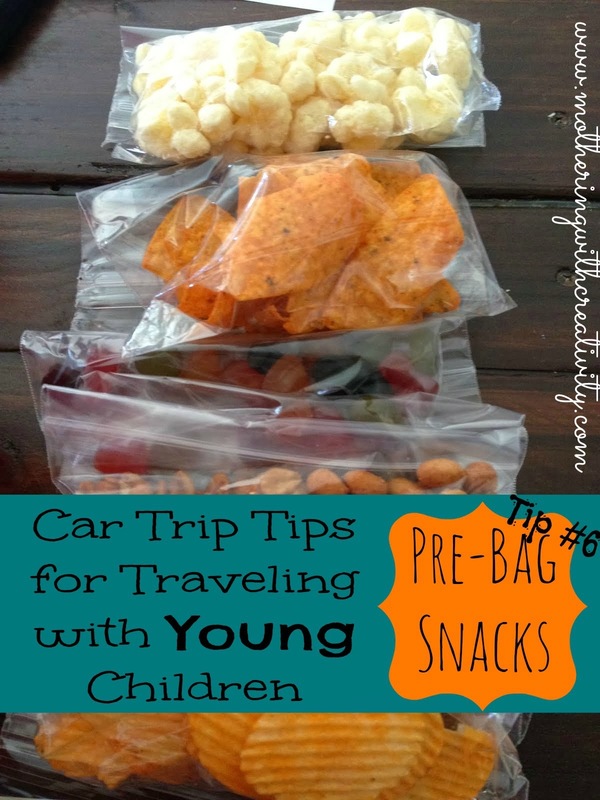 Instead of bringing all sorts of big bags filled with snacks, spend a little time before your trip to portion out snacks into ziploc baggies. Then, when your children are hungry, you don't have to dig through your bags of food or make a mess trying to portion it out to them. You can just hand them a baggie! Small drinks (water bottles, juice boxes, pre filled zippy cups, etc) are great to keep in the box, too. And, if you're the bribing type (I totally am, especially on road trips), keep a small stash of candies or lollipops in your basket, too. I will also slice and bag apples the day we leave. Note: Bananas ripen and stink quickly in the car...I have banned them from road trips! 7. Bring along special items. For us this means bringing along each of the kids' travel pillows, as well as their special blankets. The children have a much easier time relaxing and falling asleep if they have their comfort items close by. 8. Bring DVD's or special music. Our car has a DVD player built in. We only use it for trips, so it is always exciting for them when they get to use it. The kids pick a handful of DVD's and bring them along. If your kids have some favorite songs (and assuming you can handle listening to them), bring those along, too! 9. Make everyone go potty (or try) at every stop. Nothing is more annoying than a child begging to go potty 5 minutes after the last stop when they insisted that they didn't need to go. We have everyone at least try at each stop. 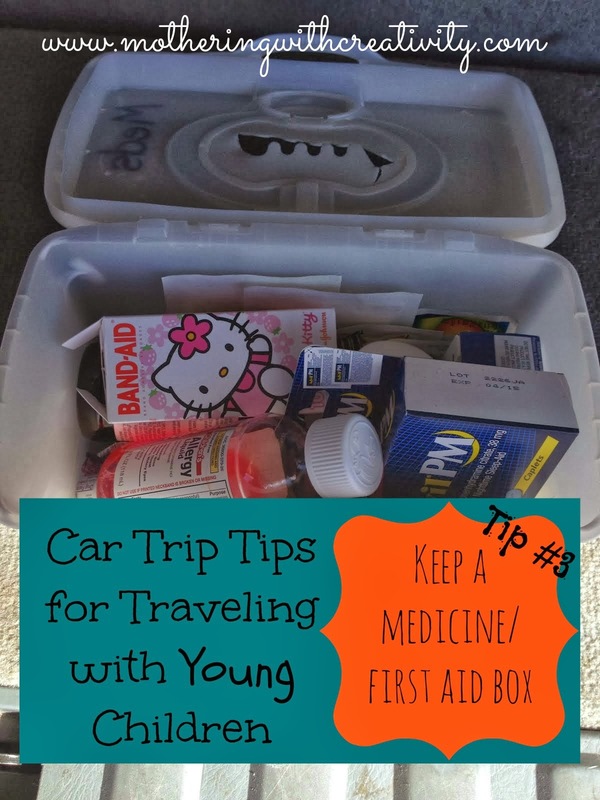 Do you take car trips with your children? What advice or tips do you have?